The solar system as well as the calendar feature work with the clock. 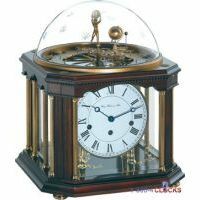 As long as you keep the clock mechanism wound the solar system work in real-time and the calendar keeps track of the the day and date. Tellurium is one of our Masterpieces that can illustrate the position of the Earth, moon and sun, month and date, as well as the constellation. And it tells time too. Solid wood with black piano finish. The Tellurium clock reproduces the annual orbit of the earth around the sun, with the earth rotating around its own axis once in twenty four hours. The moon, in turn, revolves around the earth in 29.5 days completing a full rotation around its axis. This allows the reproduction of the different moon phases as they are visible from earth. In the course of one year, the earth passes all twelve zodiac signs, months and individual days which are indicated on the flat disc. Mechanical 8-day spring wound movement with 4/4 Westminster chime on 4 polished nested bells, Separate second feature. 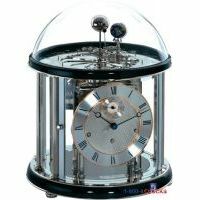 Different Hermle Tellerium models have different features, and one example showcases an 11 jewel deadbeat escapement, polished nickel plated brass, disc has milled zodiac signs, and rosettes in addition to the months and days of the year. The Tellurium has reproductions of the sun, earth and moon, incorporating the day/month indicator. All Hermle Telleriums are Made in Germany. See some examples with links to specific models. 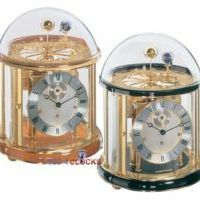 These are among the finest automata timepieces made today. 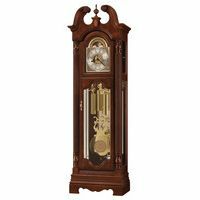 This item is a masterpiece of clock manufacture, please unpack it carefully and use the gloves provided for setting up the clock. First, take out the upper carton in which you will find the polished Sun ball, the winding key and the glass dome of the Tellurium, Please then pull out the second inner carton, with the 2 handles, out of the outer carton and take out the upper foam cushion and the Tellurium. Open up the carton with the glued foam cushion and take out the clock from the carton. Open the door of the clock and remove all of the packaging materials such as rubber, paper, foam, etc., from the hammers and bells, as well as the fixation tubes from the 3 winding holes. The power reserve for the clock, when fully wound, is approximately 1 week. Do not forget to wind the clock up regularly, if the clock stops it will require the setting procedure to be repeated in full. Using the key supplied, insert the key into the winding holes and turn the key clockwise until fully wound up, approximately 4.5 full turns. 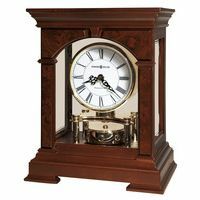 As you look at the clock, the right winding hole is for winding up the chime, the central winding hole is for the time and the left winding hole is for the hour strike. The chime shut off lever is beside the 3 o'clock position. If the lever is up = no chime, if the lever is down = chime. The night shut off will automatically stop the chime and strike during the night. The night shut off can be found between center of the dial and the 3 o'clock position. For easier identification the open dial is shown on the picture. Lever up = night shut off activated, lever down = night shut off is not activated. If the night shut off is activated the clock will not chime or strike from 10.00 PM until 06.45 AM. If the clock will not chime between 10.00 AM and 6.45 PM, when the clock has the night shut off engaged, it is out of synchronization, it is set to the wrong 12 hour cycle. You must turn the minute hand forwards by 12 hours, i.e. strike the correct number of hours to where the hour hand is originally set, turn the hour hand forwards until it is set to the hour which the clock has struck. Then move the minute hand, clockwise or counter clockwise, to the desired time. After one hour the in-built chime synchronization will ensure that the clock will chime the correct time and the following melody sequences. Automatic chime shut off – Silent between 10.00 PM and 06.45 AM. The clock is equipped with a high precision eleven jewels escapement which has been pre-regulated during the testing period of the clock. If additional regulation should be necessary, do this very carefully, do not touch the coil spring. By pushing the regulating finger approximately 1 mm you can change the accuracy up to 3 to 4 minutes per day. Shifting to the plus, +, position, left, will speed up the clock. Shifting to the minus, -, position, right, will slow down the clock. Each of the hammers should be approximately 1,5 to 2 mm away from the bed. Please check that the hammers hit the bell approximately 1 mm from the outer edge. If the hammer is not hitting the bell in the perfect position, double strike, you can bend the hammer wire slightly to adjust the hammer strike to the perfect position. Take the brass Sun ball and push the Sun carefully onto the centre axle of the Tellurium, see picture. The mechanical Tellurium reproduces the annual orbit of the Earth around the Sun, with the Earth rotating around its own axis once in 24 hours. The Moon rotates around the Earth in 29,5 days, completing a full rotation around its own axis. In the course of one year the Earth passes all 12 zodiac signs, months and individual days, which are indicated on the brass disc. By tilting the Earth axle, respectively the equator, we can even show Summer and Winter according to the seasons, sunbeams heat the Earth during the Winter with a flat angle and during the Summer with a sharp angle. 8.1) Turn the complete gear wheel carrier (A), with the black date hand, to ^ December 20th, the Winter solstice – longest night. Please be careful that you are not touching the shifting star (B) with the black hand. You can turn the black hand in either direction. 8.2) Turn the retainer (D), holding the Earth Globe, so that the retainer is located at the opposite side of the Sun. This is valid for the Northern hemisphere, for the Southern hemisphere the retainer of the Earth must be between the Earth and the Sun. 8.3) Now, turn the wheel carrier with the date hand to the actual date (C), do not touch the star wheel behind the hand. 8.4) Set the Moon according to the actual Moon phase. You will find the phase of the Moon in your diary or calendar, see also our sketch on page 6. If the Moon is full, the silver side of the Moon should face the sun, the Earth will then be located between the Moon and the Sun. If there is a new Moon, the black side of the Moon should be facing the Earth, the Moon being located just between the Earth and the Sun. The Moon assembly is mounted on a friction bushing and you have to hold the big wheel, underneath the Earth globe, when you turn the Moon around the Earth according to the present phase of the Moon. 8.5) Setting the Earth. Now turn the Earth, which has a friction bushing, according to the position you are and according to the time of day. If you are living in Europe, Europe should face towards the Sun during daylight hours. Be sure that the retainer of the Earth will not move anymore when you turn the globe. Now your Tellurium is fully adjusted, put the glass dome on top of the whole Tellurium and place the clock at the final destination. 9.) If you forget to wind the clock up, or perhaps it is your vacation and there is nobody to wind the clock up, you have to restart the whole set up procedure, from paragraph 3 above. 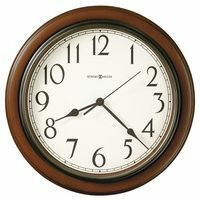 Do not put any type of cleaner, polish, water, etc., on the brass parts of the clock. If you must do this, use a clean, dry, lint free cloth. Ask your local clockmaker about future service of the movement. Since the mechanical parts of the movement can be affected by humidity, heat and cold, the time to lubricate or even clean the movement should be after 5 to 8 years depending on the environment of the clock. Do not attempt to lubricate the movement yourself as a special clock oil is required.